We had our first few inches of snow on the last day of summer this year. Remember that? It made for some nice fall colors dusted in snow. The weather forecasts were warning of a huge winter storm to strike Colorado’s front range and mountains on Tuesday night. I flew home from California to an overcast Denver International Airport. Friends like Manisha tweeted me to be home before midnight when the snow was to arrive. My RTD bus snaked its way from Denver to Boulder, hitting rain on the way. As Jeremy drove me home up the canyon, we left a steady downpour on the flats and encountered the worst white out conditions we’ve seen in 4.5 years. Shovels at the ready, we spent 2 hours clearing our driveway and the communal driveway this morning. There was a good 14 inches of super fluffy snow on the ground. By the time we had made our way to the road and walked back to the garage, another 4 inches had fallen. I scooped snow from our deck into a 1000 ml vessel and let it melt, winding up with just under 50 ml of water. 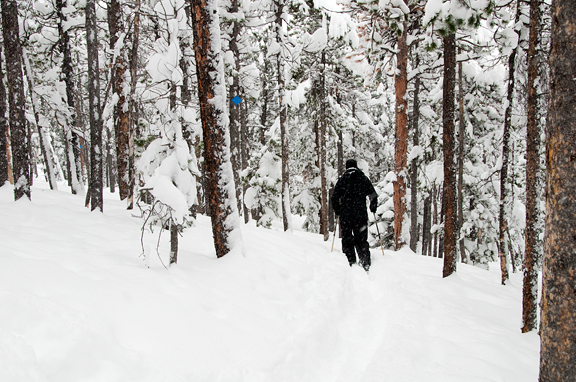 That’s our Rocky Mountain powder – 1:20 water to snow ratio. That’s why it’s so good to ski! And ski it, we did. The roads around the state were in pretty miserable condition so we didn’t even consider hitting the ski resorts (although it would have been decidedly awesome). Reports of jack-knifed trucks and closures on I-70 convinced us to get a little cross country skiing in right out our back yard. In total we’ve got about 26 inches on the ground now with 9-13 more predicted overnight. Then some more for good measure tomorrow. Just like the start of every winter season, 20°F felt just a tad chilly. I know by spring time, 20°F will feel HOT to me :) Yay winter!! Wow! That is very sincere winter-like weather. I wish I enjoyed it as much as you do. Way to make the best of it!! I can’t believe it – you’ve made me want a real, proper winter, with snow and cedars. Your photography is flawless as usual! Beautiful – we’re basking in unseasonably high temperatures here in London – 16 degrees! We hardly ever get snow and when we do everything grinds to a halt. 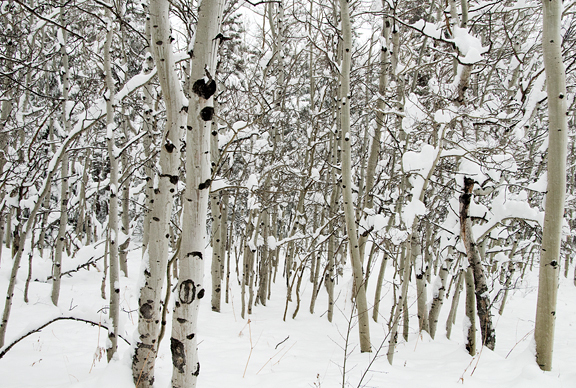 I love walking in the woods when it’s snowed. Photos of the woods look so peaceful! glek, i MISS snow! stunning. looks like you all enjoyed it well! You are such a snow bunny! I hate the snow in NJ, it’s always dirty by the next a.m.
You make it all look so beautiful! Oh, the confusion that comes when you see that blog post title on your RSS feed. Absolutely gorgeous Jen! I laugh when I think of how things go when there 3 specks of water loaded snow here every 5 years. Panick usually strikes. Ahahah! A Colorado Christmas has got be a sight to see. Thanks for being an awesome blogger hon. Wow, that’s a lot of snow! So shocking for me… here, it is still very warm and the trees have not yet lost their leaves. So beautiful. 20 degrees IS chilly. Though I recall x-c skiing and snowshoeing in CA in a t-shirt, and wishing I had shorts on as well. 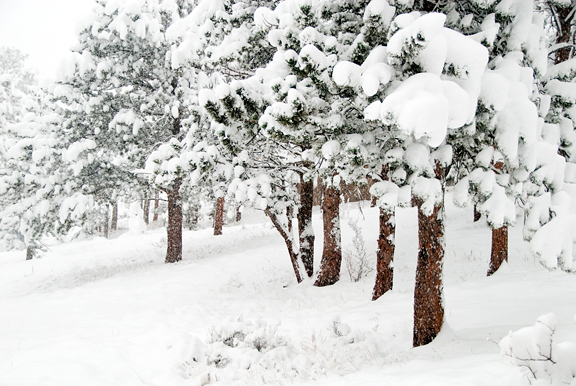 Love the snow on the Pines, that’s my favorite part of new snow in Minnesota and living in the far North of the state. We’ve just had a dusting so far, and of course it melted. Soon though – it’s coming soon! Oh man, I’m drooling at the thought of skiing through all that! If it is going to be cold and wet it might as well snow! We’re dark and rainy today and I wish I could trade it for a big snow dump! Great photos :) You had a lot of snow. When I was a kid I liked snow. But now a bit less. I hate to drive in the snow. But sometimes I like snow just because of my son (4 years old). It’s fun to see their face when they see that it’s snowing. Even at our lower elevation, we’ve got nearly 24 inches on the ground. It was great fun wandering around in our nearby natural area taking photos this morning. We missed winter when we were living in SoCal; it’s so nice to have snow again!! I live vicariously through you…sometimes–often in fact–you’re photos take my breath away. It’s high 80s and steamy here in Florida. jealous. Enjoy and thanks for sharing the beauty!!!! Isn’t it great? I’m down in the ‘burbs, but we’ve gotten over a foot here. The dog loves to play in it. And I’m lucky to be able to work from home. Life is good. Welcome home! Good to see that the snow was not wasted by you and Jeremy. Stay warm, safe, and enjoy those ski’s. Ooh….I miss it so much! 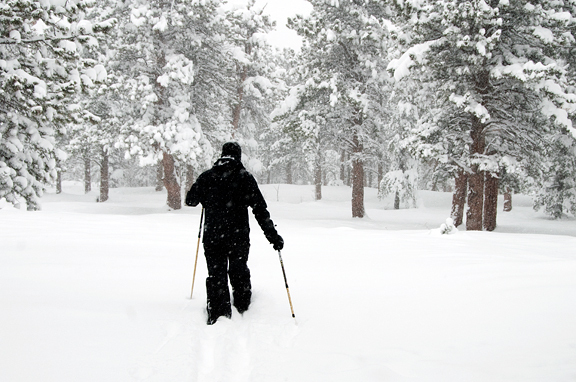 I was watching on the news and reminiscing of the good ol’ Boulder days…hopefully you’re digging out and enjoying. How wonderful! I would love to roll around in it. Holy Schamole!!! 14 INCHES with a further 4 and then WOW 26 INCHES! I’m just stunned. It never snowed like that when I was in Colorado. Oh, hang on, it did in late February that time, when we had 2.5 FEET overnight. Wow that was so awesome. It was like thigh deep in the morning. That was a good snowfall. Your snow is just WICKED. Have a blast in it Jen! Glad you all enjoyed the snow! Wendi – thanks for that award! You’re very sweet.